The appearance and nature of dragons varies in different cultures, with some of the most detailed information on dragons and their heads detailed in Chinese culture. Dragon heads often created for special events in Chinese culture have specific features: The dragon usually has a beard and antlers for ears. Unlike those of the Chinese, dragons from Western cultures are fire-breathing, evil creatures. Chinese and Eastern cultures depict dragons as benevolent and wise creatures. Cut out the desired shape of the dragon's head from a piece of red paper. The head of the Chinese dragon is often like the shape of a camel’s head. Cut a rectangle from green paper. Cut wavy, parallel lines from one short side almost to the opposite side to make the beard of the dragon. Glue the uncut end of the green paper to the back of the chin of the dragon head. 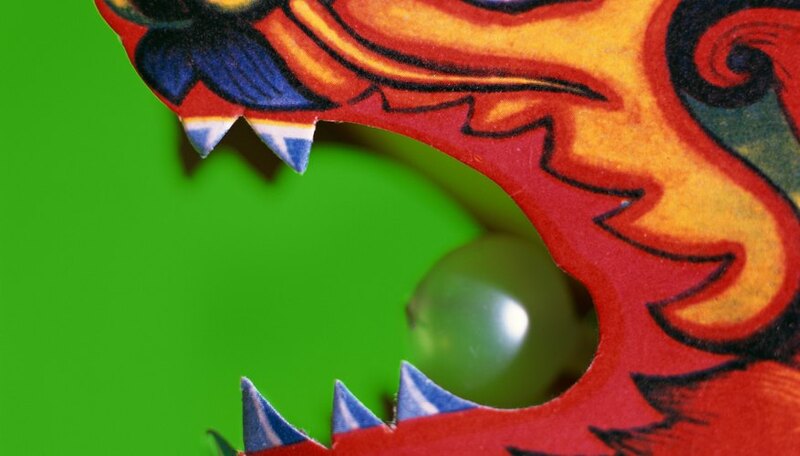 Cut teeth from a piece of white paper and glue them in place in the position of the dragon's mouth. Two eye shapes can also be cut from white paper and glued into place. Cut colored paper into shapes for the nose, ears and other decorative pieces of the dragon head. These pieces can be glued into place around the head of the dragon. Glue sequins to the nose and eyes of the dragon head to represent the nostrils and pupils of the dragon's nose and eyes. The face of the dragon should represent the nature of the animal, the face can be friendly or fierce.